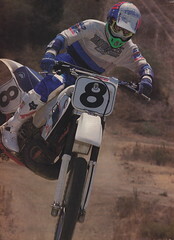 In the eighties, Super Motocross was one of my favorite moto magazines. Published by Petersen Publishing, SMX was a motocross-focused offshoot of Dirt Rider. The magazine had great photography and a more lighthearted feel than competitors like Motocross Action. In 1988, they took a look at Ricky Johnson’s factory Honda for and published this article on its inner workings. Personally, I love this stuff and I hope you all will too. Here is the article in its entirety as it appeared in the October 1988 issue of Super Motocross.